Short Description Many annoying ads appear. They may redirect the user to suspicious sites that might contain malware or non-legitimate products. Those products might trick the user into making a purchase. “FDownloader” is classified as a Potentially Unwanted Program (PUP) that after being installed on your machine affects registry entries and browser settings. It then can collect important personal data and display many unwanted advertisements. The user might be redirected to fake product pages which aim is to generate revenue per every click or by the purchase of such a product. FDownloader – How Did I Get It? FDownloader usually gets into your system through third-party installers. It can sneak into your computer without your knowledge, by concealing itself in freeware installations and bundled packages. In these packages, additional components for installation are not always disclosed in a proper manner, and people get tricked into installing potentially unwanted programs such as this “FDownloader”. Sometimes that can be avoided by clicking on the “Advanced” or “Custom” option in an installation setup to see what will be installed. Another way of getting this adware is by installing it as a free application or browser extension for popular browsers like Mozilla Firefox, Google Chrome, Internet Explorer and etc. Also, it can get in your machine through drive-by-downloads via outdated browser or Flash Player plugin. FDownloader claims that it is a legitimate program that will help you with managing your downloads, especially your video downloads and the free converting of those videos into other formats. Those are false claims, because the program has only two main options “Download site” and “Download video”. Videos that you try to download contain one file that is really small in size and there is no converter involved – just the file type extension is renamed, and selecting the option for converting or not gets you an unusable file. Trying to “Download a site” also gets you one small-sized file which if you choose to be a text file it can open some code from the page but serves you no purpose. So the user agrees to be targeted with advertisements upon clicking “Agree” when installing the application from the site or by simply installing the program from bundled freeware and not knowing about the program or its license agreement at all. When this very suspicious program is installed on your computer, it can collect information such as your IP address, the websites you visit, specific pages you view, your search queries, and etc. Such information might contain personally identifiable details and according to the agreement above – it is shared with third party companies, who can abuse it to generate revenue for their sites. After the adware is on your machine it modifies registry entries and can also modify browser settings, in order to potentially add an extension or a plug-in to it as well. When you are browsing websites intrusive ads could appear such as discount coupons, pop-up and pop-under ads, banners, and other promotional products and search suggestions and even hyperlinks might be embedded into the text of popular webpages. If any of those ads are interacted with, the user could be redirected to a site with malicious content or an advertisement page of a fake product. The main aim of Fdownloader is to generate as much traffic as possible to domains, which could easily be monetized through an online marketing platform. Also the user can be tricked into buying one of the advertised, suspicious products which might not help at all, and even infect the computer with similar PUPs. To remove FDownloader manually from your computer, be sure to follow the step-by-step removal instructions below. In case the manual removal does not get rid of this PUP completely, you should search for and remove the leftover files with an advanced anti-malware program. Installing such a program will also make sure that your system is safe from other, future threats you may come across. Follow the instructions above and you will successfully uninstall FDownloader. After FDownloader is removed, restart Mozilla Firefox by closing it from the red “X” in the top right corner and start it again. From the opened “Extensions” menu locate FDownloader and click on the garbage bin icon on the right of it. After FDownloader is removed, restart Google Chrome by closing it from the red “X” in the top right corner and start it again. Select FDownloader to remove, and then click ‘Disable’. A pop-up window will appear to inform you that you are about to disable the selected toolbar, and some additional toolbars might be disabled as well. Leave all the boxes checked, and click ‘Disable’. After FDownloader has been removed, restart Internet Explorer by closing it from the red ‘X’ in the top right corner and start it again. A pop-up window will appear asking for confirmation to uninstall FDownloader. Select ‘Uninstall’ again, and the FDownloader will be removed. Step 3: Remove FDownloader automatically by downloading an advanced anti-malware program. To clean your computer you should download an updated anti-malware program on a safe PC and then install it on the affected computer in offline mode. After that you should boot into safe mode and scan your computer to remove all FDownloader associated objects. NOTE! Substantial notification about the FDownloader threat: Manual removal of FDownloader requires interference with system files and registries. Thus, it can cause damage to your PC. Even if your computer skills are not at a professional level, don’t worry. You can do the removal yourself just in 5 minutes, using a malware removal tool. Threats such as FDownloader may be persistent. They tend to re-appear if not fully deleted. A malware removal tool like Combo Cleaner will help you to remove malicious programs, saving you the time and the struggle of tracking down numerous malicious files. Threats such as FDownloader may be persistent on your system. They tend to re-appear if not fully deleted. A malware removal tool like SpyHunter will help you to remove malicious programs, saving you the time and the struggle of tracking down numerous malicious files. Note! Your computer system may be affected by FDownloader and other threats. SpyHunter is a powerful malware removal tool designed to help users with in-depth system security analysis, detection and removal of threats such as FDownloader. 1. 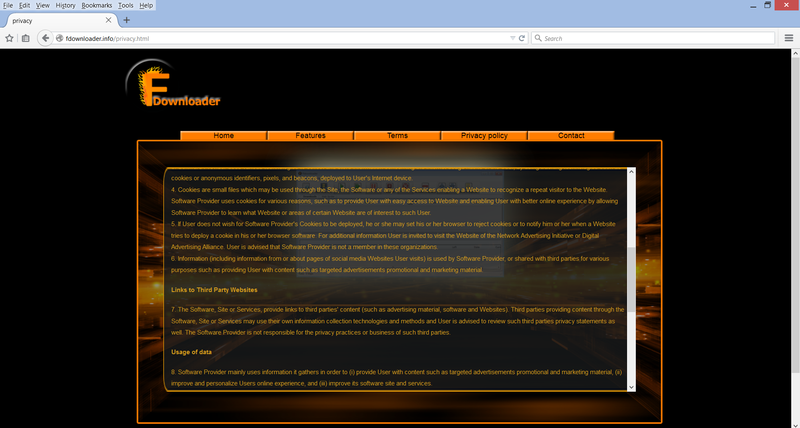 Install SpyHunter to scan for FDownloader and remove them. 2. Scan with SpyHunter, Detect and Remove FDownloader. Ransomware infections and FDownloader aim to encrypt your files using an encryption algorithm which may be very difficult to decrypt. This is why we have suggested several alternative methods that may help you go around direct decryption and try to restore your files. Bear in mind that these methods may not be 100% effective but may also help you a little or a lot in different situations. Note! Your computer system may be affected by FDownloader or other threats. Remove FDownloader by cleaning your Browser and Registry. Fix registry entries created by FDownloader on your PC. Combo Cleaner is a powerful malware removal tool designed to help users with in-depth system security analysis, detection and removal of threats such as FDownloader. Step 5: In the Applications menu, look for any suspicious app or an app with a name, similar or identical to FDownloader. If you find it, right-click on the app and select “Move to Trash”. Step 6: Select Accounts, after which click on the Login Items preference. Your Mac will then show you a list of items that start automatically when you log in. Look for any suspicious apps identical or similar to FDownloader. Check the app you want to stop from running automatically and then select on the Minus (“–“) icon to hide it. Remove FDownloader – related extensions from your Mac’s browsers. A pop-up window will appear asking for confirmation to uninstall the extension. Select ‘Uninstall’ again, and the FDownloader will be removed. When you are facing problems on your Mac as a result of unwanted scripts and programs such as FDownloader, the recommended way of eliminating the threat is by using an anti-malware program. Combo Cleaner offers advanced security features along with other modules that will improve your Mac’s security and protect it in the future. Hey !, I found this information for you: "Remove FDownloader Fully from Your PC". Here is the website link: https://sensorstechforum.com/remove-fdownloader-fully-from-your-pc/. Thank you.